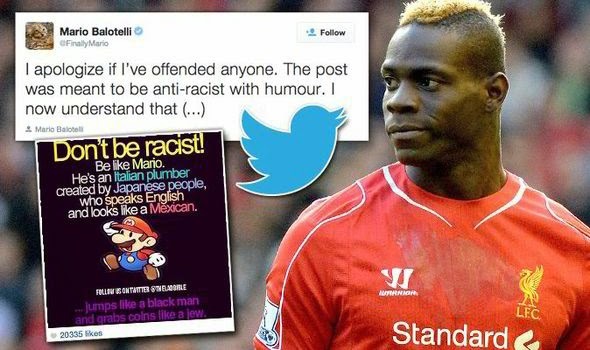 Liverpool striker Mario Balotelli has been banned for one match with FA as punishment for a picture he posted online which was named 'Super Mario post ". Balotelli will not play in the match against Arsenal on Sunday and will pay a fine of £ 25,000 and will be attending social networks class education. He posted on Facebook apologising about the post.. This is what he said. "Following the recent events related to my “Super Mario” post, the FA decision has made clear that it was wrong. I am sorry that my team-mates and supporters of Liverpool FC have to be penalized for something I did and now come to regret. It is my intention to comply with the decision of the FA and make sure it never happens again." Tiago Cardoso Rdz — "mario listem to me ... you have the potencial to be the best strike in the premier league , but you just need to work hard and the goals and your performance will inprove hope you read my comments... i am your big fan"
Rob Smith — "Don't worry about it, there's far worse racism coming from the boardrooms around England and even worse from the stands in each ground each week. Forget this and focus on helping your team-mates and banging in the goals for LFC and Italy." Matty Reeves — "How about putting as much effort into pressing the ball and scoring a goal as you do posting shite on Instagram:Twitter and Facebook, just a suggestion mate"